The antlers on bucks in full velvet have incredible tactile appeal. 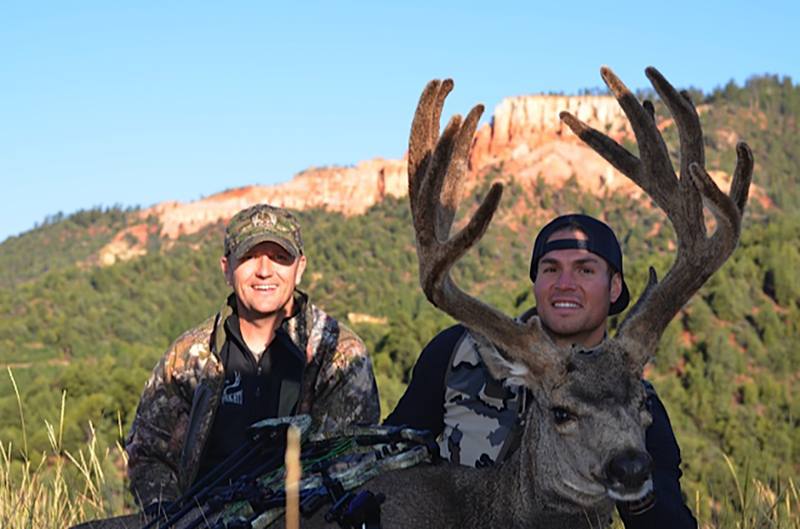 Every hunter has heard the story of a buddy who harvested a beautiful, trophy-sized buck only to arrive at the taxidermist with a patchy, ragged-looking specimen. Once velvet is off there is no way to reattach it. That’s right — there’s no way. Not even if you save all the shed velvet and bring it along with your now hard horned set of antlers to the taxidermist. Velvet is like a banana peel. Basically, it’s just a skin, with no real veins running through it. Although some shops offer sprayed-on flocking, the results will likely look too perfect, and unnatural. The flocking process can also run $2.50 per Boone & Crockett inch, so your 200-inch buck suddenly got $500 more expensive to preserve. Do Not Touch. Velvet is delicate. In September a buck’s velvet is slick, like a bar of soap, and primed to come off. A buck can rub off all his velvet in 10 minutes; just think what your hands can do if you drag a buck by his antlers. Grab those antlers, pull hard, and you’re likely to end up with your hands full of velvet while the deer stays in the same spot. The oils in your skin will also do two things. First, it will cause the velvet to become nappy and matted, particularly in warm conditions. Second, when it meets the natural oils from the deer velvet, it will make the environment more of a potential breeding ground for bacteria. Bring rope. Many hunters grab along the base of the antlers to drag a buck after a successful harvest. Grabbing and pulling will puncture the velvet on all the little knobs around the base that give antlers their character. 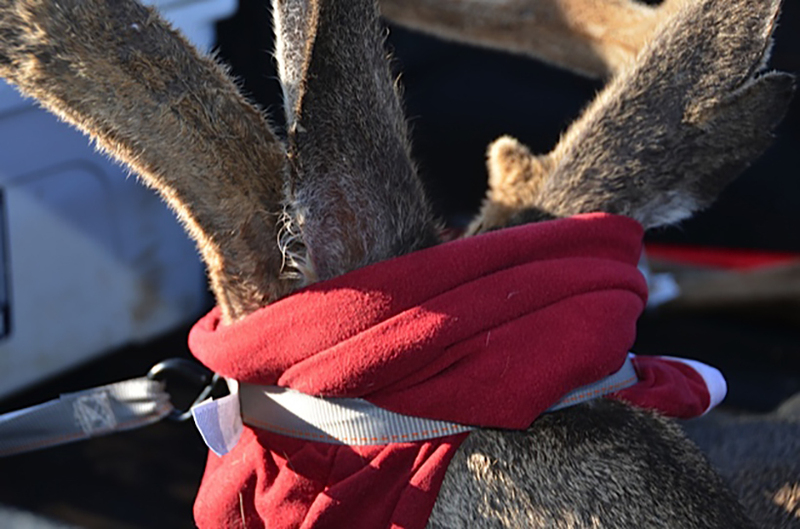 Instead, if you need to move the entire deer, use a rope to wrap around the deer’s neck and base of the skull to drag it with instead of using your hands. Do Not Rub. Any kind of abrasion will ruin velvet, especially dragging. Continue to avoid all contact with anything that’s potentially abrasive, including your backpack straps when hiking out of backcountry. Instead, strap the skull to your pack, not the antlers themselves. Wrap it. If for some reason you can’t cape your buck, gently wrap the antlers with your base layer or another piece of spandex material. Wrap them tight and tape down the material with electrical tape. Wrapping before strapping down reduces potential friction. Now you can carry your antlers with straps if needed. Cushion your buck for the drive. 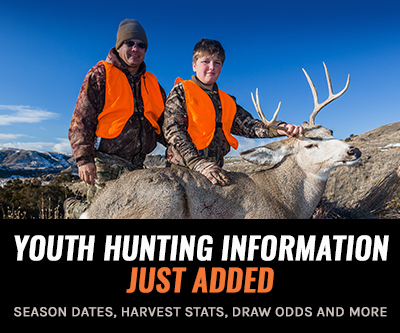 If your hunt is closer to home, you don’t need to follow quite as many steps. 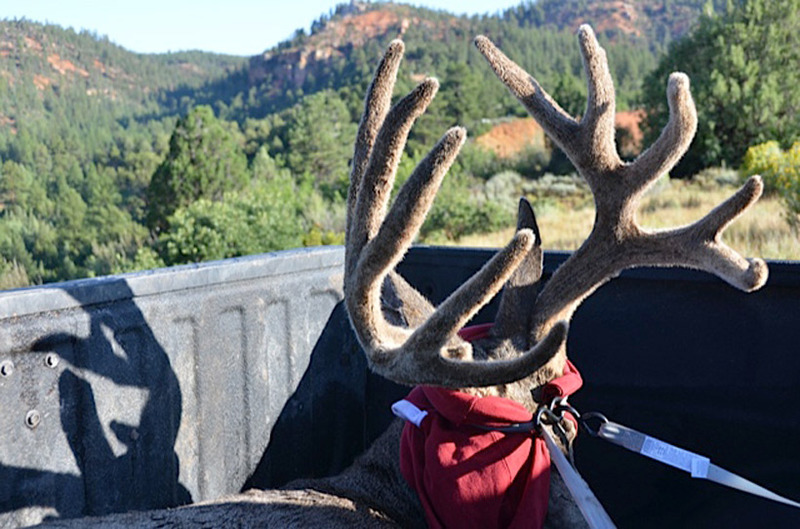 Get your deer to your truck using a wheeler or a cart instead of dragging it by the horns. 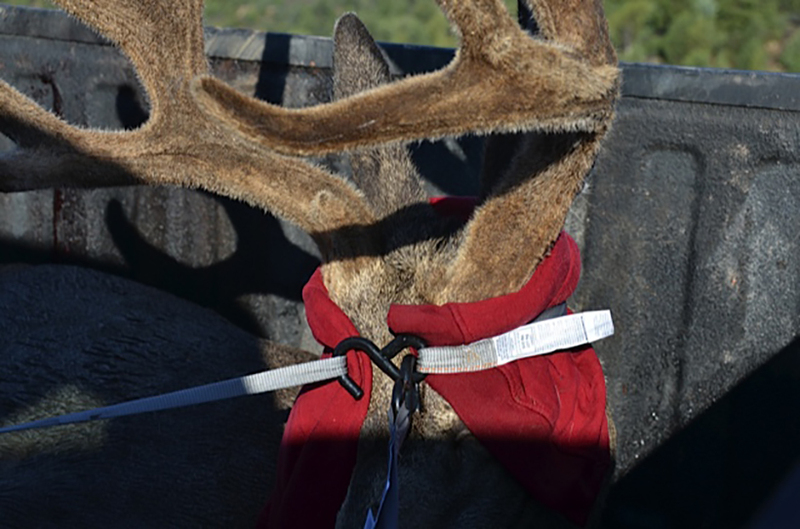 Then secure the head so the antlers don’t come in contact with any surfaces. Don’t have straps? Put something soft, like a jacket, pillow or sleeping bag, underneath the antlers. This prevents the velvet rubbing off when you rattle down the road or your buddies check out your buck. Cool and cover. Heat and blood speed the decomposition process. Keep your buck as cool as possible. A shade tree is ideal. Cover the antlers to keep the flies off, but never use a plastic garbage bag. The plastic will turn your velvet into a ruined, smelly mess. 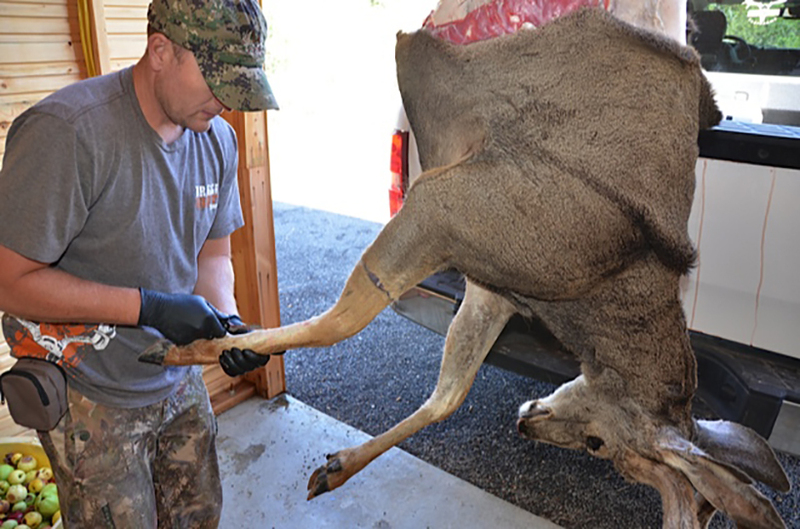 Instead, cover the antlers with a deer meat bag to allow for air circulation without any spoilage. Don’t hang. Antlers in velvet are full of blood that needs to be drained out if you’ll be staying any length of time in the backcountry. Some say to hang the buck upside down by the skull and make pinholes with your knife at the tip of each tine. Blood should then drain out the tips. However, I don’t recommend this method because those small cuts split open the living tissue and are likely to crack when they dry, leaving extra work for your taxidermist to try to repair. Drain without making a mark. The better drainage method is to get the hide off the skull of the deer by caping it. 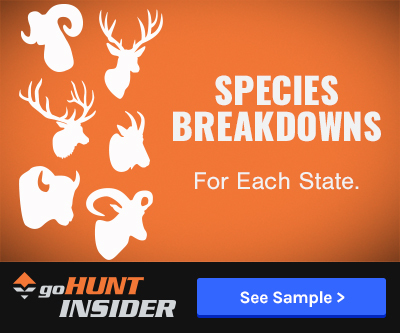 This process will sever the blood vessels that run outside of the skull between the antlers and the velvet, effectively draining the antlers themselves. Resist cutting the cape too short; you’ll need from the middle rib forward. Your taxidermist can always cut off what isn’t needed, but can’t make a substantial cape appear from nothing. Then prop the antlers against a tree, base down. The blood will simply drain out of the bottom of the antlers without leaving any marks. Leave chemicals to the experts. 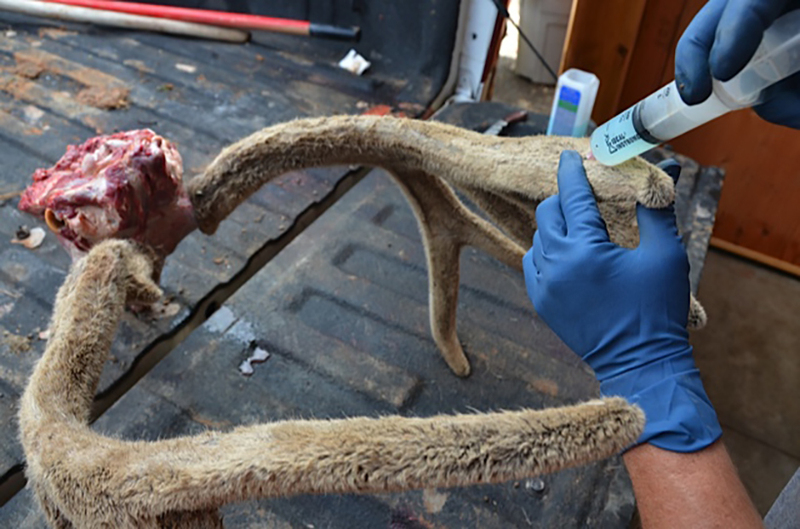 You can get embalming fluid from your taxidermist before your hunt, but in a backcountry situation the last thing you need to worry about is dealing with this highly potent chemical. Embalming fluid is extremely dangerous and requires you to wear double latex gloves and eye protection when using it. 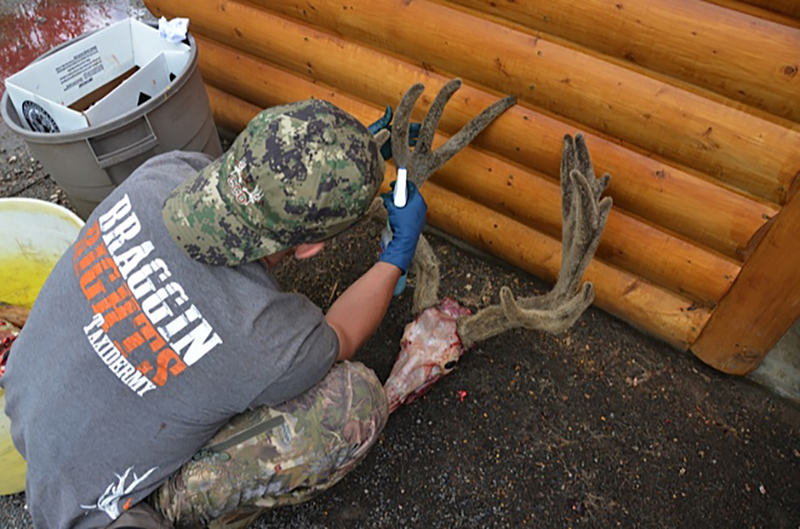 The fluid also demands a syringe and needle to inject the antlers properly. Remember: embalming fluid preserves whatever it touches, so if it gets on your skin, seek emergency medical attention. Not to sound too dramatic, but if embalming fluid gets in your eye, and you’re out of easy ambulance/EMS range, you will most likely lose it. Be quick. Velvet starts to decompose right from the moment of harvest. Get those antlers and cape to a taxidermist today. Not tomorrow. The quicker your taxidermist can inject your velvet with embalming fluid, the better. This fluid bonds the proteins together and stops decomposition in its tracks. Now your velvet will last for years, no matter how you mount your trophy. Take care with velvet antlers and you’ll have a beautiful trophy as a way to remember that great hunt. Taxidermists can fix small blemishes with an airbrush and epoxy, but they can only make a deer look as good as when it came in the shop, not better. 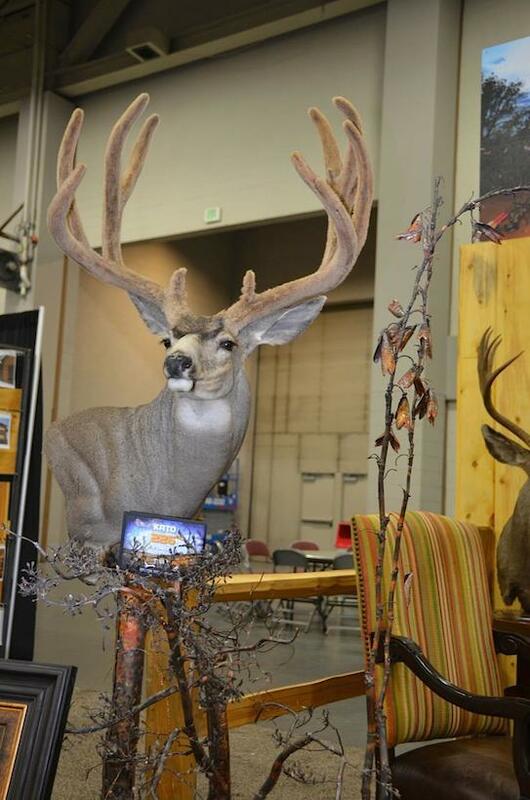 A finished velvet buck is an impressive sight. Be sure to take extra care in the field to protect the velvet so you can give the taxidermist a chance to make a breathtaking mount.